This entry was posted in Events, Museum and tagged Jean Woodham, Jule Collins Smith Museum of Fine Art on May 24, 2013 by Wire Eagle. AUBURN UNIVERSITY – The Jule Collins Smith Museum of Fine Art will present the works of artist and Auburn alumna Jean Woodham in exhibition as part of its 10th year anniversary focus on sculpture. “Full Circle: The Sculptures of Jean Woodham” will be on display June 1-Oct. 12 and will include 16 pieces of sculpture in bronze, brass, wood and steel. Woodham, a 1946 alumna of Auburn, has two sculptures sited on campus: “Spinoff” at the museum’s entrance and “Auburn Monody” outside Goodwin Hall. 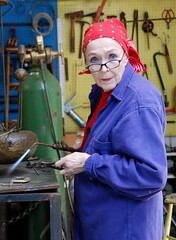 Her early works were forms in stone, clay and wood, but she began welding in the early 1950s. Her large outdoor sculptures can be seen at museums, government buildings, schools, corporate headquarters and outdoor spaces, with more than 150 pieces in public and private collections. Her commissions have come from the World Bank, General Electric, Nynex, GTE, the New York Board of Education, Connecticut Commission on the Arts and Auburn University, among others. While some sculptors make two or three graduated sizes of a piece before the larger version, Woodham first made a five foot version of “Auburn Monody” and moved directly to the nearly 20-foot piece seen today at the entrance of Goodwin Hall. The word monody means a dirge sung by one voice; Woodham said “Auburn Monody” was a dirge for John F. Kennedy. Admission to the exhibition is free courtesy of the museum’s business partners. 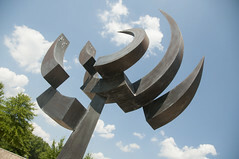 A preview of “Full Circle” will be held on Thursday, May 30, at 6 p.m. for student and museum members. Students can get a free membership on the museum’s website with a valid Auburn ID. Levels and benefits of museum membership are available at www.jcsm.auburn.edu/join.